Love the story, love the illustrations. Perfect introduction to the man behind these interesting contraptions. 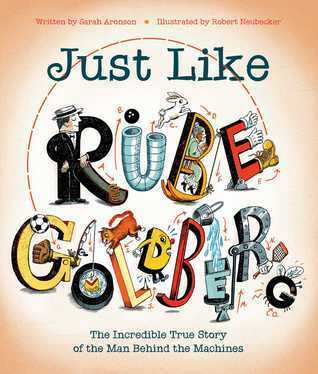 A completely delightful biography about Rube Goldberg. Snappy text, an unbelievable but true story, and an inspiring message make this book nonfiction gold for kids. This book has an energy and humor to it, much I imagine like Rube Goldberg himself, that makes you smile and want to jump up and do something when you're done. A biography picture book you can definitely read aloud and one that will undoubtedly get the wheels turning in the little minds that hear it. This was a cute little biography on Rube Goldberg’s life that features some wonderful art work and Rube’s cartoons on the end pages! It lost a star from me though because in the “Got more questions about Rube Goldberg?” section, they mention that his son Tom changed his last name to George which was his brother’s first name, but the best part of the story is that George wanted to be like his brother, so he changed his name to George George! They missed out on Rube Goldberg’s son George George an This was a cute little biography on Rube Goldberg’s life that features some wonderful art work and Rube’s cartoons on the end pages! It lost a star from me though because in the “Got more questions about Rube Goldberg?” section, they mention that his son Tom changed his last name to George which was his brother’s first name, but the best part of the story is that George wanted to be like his brother, so he changed his name to George George! They missed out on Rube Goldberg’s son George George and that is the best random fact out there about Rube Goldberg! An outstanding picture book biography of the wildly inventive and entertaining cartoonist. Sarah Aronson - Sarah Aronson began writing for kids and teens when someone in an exercise class dared her to try. Since then, she has earned an MFA in Writing for Children and Young Adults from Vermont College of Fine Arts, and published three novels: Head Case, Beyond Lucky, and Believe. Her newest book is the first in a series called The Wish List! Book One is The Worst Fairy Godmother Ever! I'm so excited to talk to kids about Isabelle's challenges as she begins her fairy godmother training. Book Two, Keep Calm and Sparkle On, will be out in January! When Sarah is not writing or reading, she loves working with other writers in one of her classes at Writers on the Net (www.writers.com ) or the Highlights Foundation. She is also the cofounder and organizer of the Writing Novels for Young People Retreat at VCFA, now approaching its fourteenth year. She was beyond thrilled to serve as the second mentor for SCBWI Illinois Laura Crawford Mentorship. Like tips or talking about the creative process? Sign up for her weekly newsletter, Monday Motivation, on her website, www.saraharonson.com.